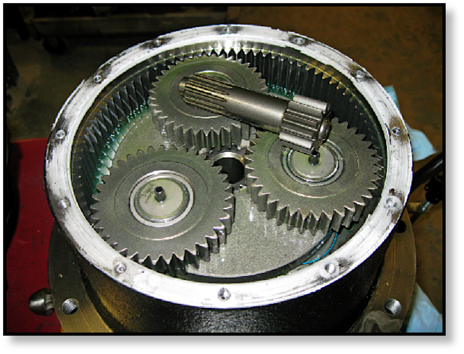 In this Shop Talk Blog post, you will learn how to troubleshoot problems with the gear oil in your final drive, focusing on leaks as well as having too much fluid in the planetary hub. We typically recommend checking the gear oil about once every 100 hours of operation and changing the oil at least once a year. The first gear oil issue we’re going to look at is the simplest: an oil leak. While it's easiest just to keep topping off the oil level, an excessive loss of oil is something that shouldn’t be ignored. However, first we need to determine what type of oil is leaking. Hydraulic fluid has a much thinner consistency than gear oil, so if the leak is a thin fluid, then it is likely hydraulic fluid. 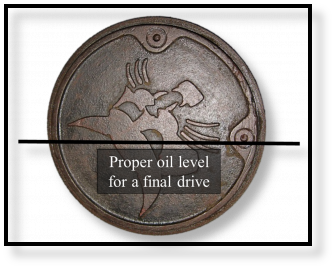 A final drive only contains about two quarts of gear oil on average, so if there is an excessive amount of fluid leaking then, again, it is going to most likely by hydraulic fluid. If oil is leaking from behind the sprocket, and possibly on the tracks themselves, then the most likely culprit is gear oil coming from a leaking floating face seal (also referred to as main seal, mechanical face seal, or duo-cone seal). You need to replace the floating face seal as soon as possible, because not only can gear oil leak out but contaminants like sand and water can make their way inside your final drive. If the oil is coming from the gearbox cover, on the other hand, then it could be that the cover or casing has been physically damaged. In that case, you would need to replace the cover o-ring. If that doesn’t solve the problem, then the cover itself may need to be replaced or the gear hub casing may need to be machined to remove distortion. The opposite of a leak is having the gear oil level too high. This can happen when hydraulic fluid leaks into the gearbox. 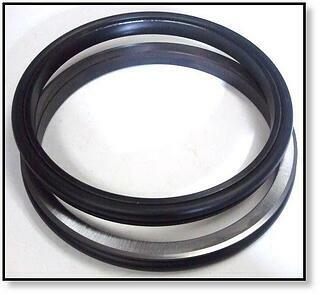 One potential cause is either a leaking oil seal or worn out bearings. If this is the case, you need to have them replaced as soon as possible to prevent further damage to your hydraulic motor. There can be another more serious cause for your gear oil level to be abnormally high. If the case drain filter becomes clogged, pressure can build up in the case drain line. As this pressure builds up, it will blow the oil seal and allow that hydraulic fluid--which is under high pressure--to enter the gearbox. This is a serious problem, and if not addressed it can devastate your final drive. That's why checking and replacing the case drain filter according to manufacturer specifications is something that should never be ignored. Issues with gear oil should never be ignored, whether its a leak or too much fluid in your gear hub. Regularly checking the gear oil levels will help you to spot these problems before excessive damage is done to your final drive motor. Remember: gear oil issues will lead to something wrong with your final drive. Again, we cannot emphasize this enough: do your maintenance! It can literally save you thousands of dollars.